Our second grade class has been studying about the brown bat because brown bats live in Fort D, a Civil War site across the road from our school. In the spring and summer, we can see the bats flying over the school eating the insects attracted by our lighting. 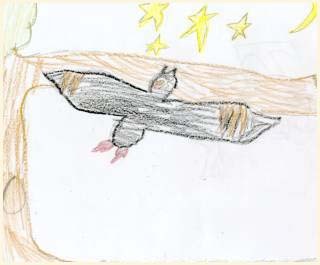 So please take a look at our bat quiz, bat poetry and bat pictures. We enjoyed doing our research and we hope you enjoy our results. 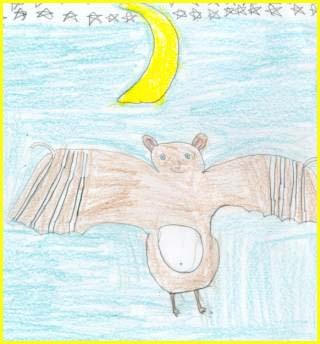 Are brown bats bird or mammals? Bats are mammals because they have the same body parts as us. They also have a brain. What do brown bats eat? How many insects can a bat eat in one evening? Bats are terrific hunters. A little brown bat can catch 150 mosquitoes in 15 minutes. The gray bat can gobble 3000 insects in one night. Bats help get rid of insects that bite people. Bats also zap moths,beetles and grasshoppers. If you ate like a bat, how many peanut & butter jelly sandwiches would you have to eat every day? You would have to eat 125 peanut butter & jelly sandwiches. Do all bats eat insects? No, all bats don't eat insects. Some bats eat fruit. Bats are good hunters. They hear better than us. 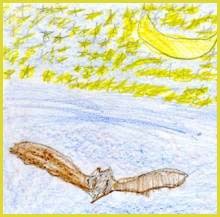 Brown bats use echolocation to find insects. They send out a high sound that bounces back to them when it hits an insect. The bat then knows which way to go to catch that insect. Bats want to get into people's hair. False. The bats are just trying to catch bugs. They drink the milk from their mom. Bat's wings are actually their hands. Bats fly with their hands. The bones in their wings are the same as in our hands. The hooked claws are their thumbs. Like your skin, bat wings can heal if punctured. Bat's often will wrap their wings around themselves as they hang up for good day's sleep. They hang downwards clinging to the rafters with their feet. Brown bats hibernate in mines and caves for the winter. How do people cause hibernating bats to die? They walk into a cave and wake it up so it will have to fly away. That will take away a month's energy. Are there really vampire bats? Yes, vampire bats drink blood, but from pigs, cows and chickens. It will bite them when the animal is sleeping. Why are many bats endangered? Years ago there were many bats. Some caves had millions of them. Caves have been filled in. Some have been turned into tunnels for cars. How are bats helpful to people? They eat insects that cause damage to crops and trees. You can build a bat house for bats. You can stay away from their caves. Bats are very, very late! From chickens, cows and pigs. From pigs, chickens, and cows. by Nacole Who? What? When? Where? Why? So they can eat bugs. Bats are flying in the sky. They make contact with the bugs. and get eaten by the bat. so that's how bats eat and live. Mother bats eat some bugs and come back to feed her babies. by Chase Bats fly at night. They like to eat insects. They drink pig, horses and cows blood. Some get mosquitoes out of here. I just love bats, bats! I don't like them anyway.